The voices of Overseas Filipino Workers (OFW), the modern day heroes of the Philippines screaming to the government particularly to the Bureau of Customs to stop their inspection of each “balikbayan” boxes, was heard with bang. Perhaps the sound made by OFW’s was so loud there’s nothing for the government to do but yield. In a report made by GMA News, President Benigno Aquino III has given instructions for the Bureau of Customs to stop the physical inspections of balikbayan boxe unless X-ray and K-9 examinations give rise to suspicions that they contain prohibited items. President Benigno Aquino lll together with Finance Secretary Cesar Purisima and the Bureau of Customs Commissioner Alberto Lina, met on Monday afternoon and decided for the agency in question to stop their physical inspection of the modern day “love letter” of an OFW to his/her family in the Philippines. Balikbayan boxes should undergo mandatory X-ray and K-9 examination for free to the OFW, said in a statement by Department of Finance. However, a physical inspection will be made if there are derogatory findings from the X-ray or K-9 examination, it added. 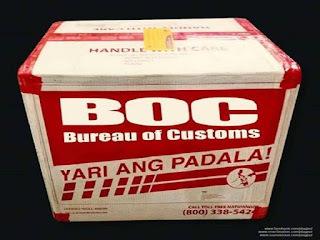 It can be recalled that the Bureau of Customs received a never-ending bash from netizens but more so from OFWs, telling them that the BOC is preying and milking our modern day heroes because of greed and their love for corruption. They likened the agency to a crocodile who seem to have an insatiable appetite from things our OFWs worked hard for.